The online dating sites listed here offer the ability to search by height, or their primary focus is on tall singles (or at least those that are taller than average). These sites give you a chance to meet others based on your interests and their height. Tall Online Personals is an online dating site built specifically for taller than average singles. If you are tall (or just like taller people), join for free and take advantage of being surrounded by a community of tall people. Tall Passions is a free dating site for tall singles. Join for free and take advantage of free email, chat, forums and more. Niche dating has exploded online, providing sites that are exclusively focused on one particular group of people (and the people who are interested in that group). If you are interested in the Tall community, Tall Dating Connexion is the site for you. It only takes minutes to create a free account, and then you are free to check out the singles who have also been drawn to this site. You can't meet someone just by looking at the homepage, so join...and start having fun! Members of 'Date Tall People' are typically at least a little taller than average, if not quite a bit. If you are looking to date tall people, you have come to the right site. It only takes a minute or two to set up a free account to see if this site is the right one for you. The key to a good online dating site for tall people is to have lots of tall members. Kindof makes sense, doesn't it. Well, as part of one of the largest online dating network, Tall Friends has plenty of taller than average members looking to meet others online. If you are at least a little taller than average (or you are attracted to those who are), then you should check out Tall Friends. "Tall Men Together gives us a chance to hang out with other guys that share our unique perspective." 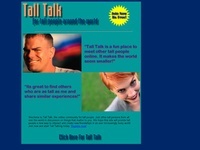 Social group that facilitates networking and friendship between really tall men. Online community forums for tall singles. Information provided on this website is believed to be accurate; however A Greater Date does not guarantee it's accuracy. Verify any information presented here before joining any program.